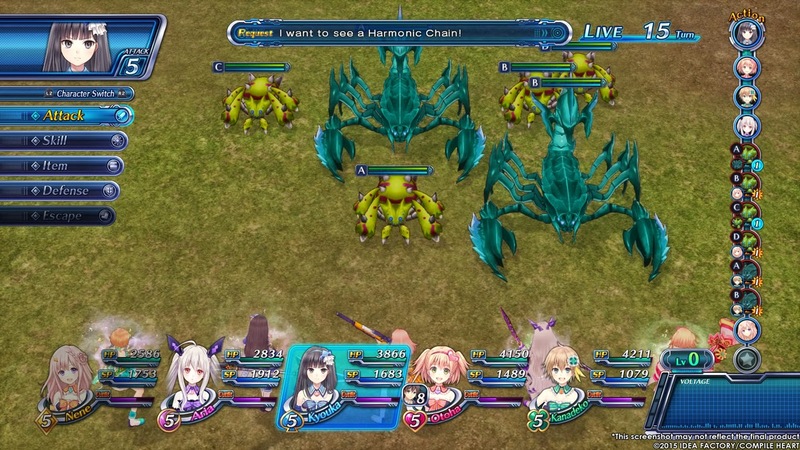 Omega Quintet is Idea Factory International's first PS4 outing. It takes place in a world where a phenomenon called Blair is turning creatures into monsters called MAD. The only people that can stop the Blair and MAD are super powerful magical singing idols called Verse Maidens. Yes, really. It's a zany premise, I know, but I like that it's so silly and unique. The story mostly follows the character you play as, named Takt and his childhood friend Otoha. Otoha has grown up and idolized the idol Mamoka, who has single-handedly been keeping the city safe for years. How many years? Well, she looks 17, so.... more than that. The characters start off as tropes, but they are actually pretty entertaining. I frequently found the dialogue funny as the characters would banter with each other, make fun of Mamoka's age, or Takt complaining about how he doesn't want to do the job that is thrust on him. While I'm sure a lot of people won't like it, I enjoyed the dialogue, and would look forward to watching all the skits around the base whenever a new chapter rolled around. The game is in both English and Japanese, so you can hear it in whichever language makes you more comfortable. The format of the story was also interesting. It's set up like a TV show, so each chapter begins with the game's opening video and even closing credits that are show scenes from that chapter. The story in each chapter was fairly concise while definitely being part of the bigger narrative, and would sometimes even end with a cliffhanger or some other mysterious scene that is very prevalent in anime shows. Although, this lead to most chapters following the formula of plot -> quests -> plot -> chapter end, repeat. Not the most unique flow to a game, but I still like the episodic nature of the story. This might be IFI's first PS4 game, but moving in the field seems very familiar. Just like its previous siblings of HD Neptunia and Fairy Fencer F, you run and jump around in areas that have enemies sprinkled throughout. These areas are bigger than either of those games, but the enemy count remains similar. The bigger areas have stretches that are devoid of opposition, but the smaller ones have them practically on top of each other. The areas themselves aren't bad, with decent scenery representing the ruins of the life that used to be. You can also attack enemies before they contact you to gain an advantage in battle. The attack is a strange sparkle that the leader throws out, but it doesn't fly as far as I would think. There's nothing wrong with the field movement, but it isn't unique, especially if you have played other Idea Factory games. Battles, though, do have their share of unique features. Each weapon and skill has a different effective range that slightly affects its damage and accuracy. Energy skills (magic) and Mic skills (weapon-based attack skills) take SP, same as most other games. There is also a voltage meter thrown in that gives some bonuses, but I mostly used it for each girl's super move. Skills add a certain amount of wait time, and the more turns you take the longer it takes for your next turn. You can also assign Takt, the manager, to a girl and he can shield them or do additional attacks when they strike. While he can only do that so many times each battle, the only time I would run out is some of the boss fights, so just use him whenever you can during normal encounters. There are also special chain attacks that are activated by using certain skills with the different girls in succession. You have to activate Harmonics to do them, though. There's also Live Concert, where a song will play in the background and people request certain actions, which gives you bonus experience at the end of the fight. While it can seem daunting with all the different factors to consider, you can still just keep hitting enemies until they die. I usually went with "use circle targeting moves to hit as many foes as possible, then finish them with normal attacks" approach. I appreciate the more complicated stuff, but I'm glad I don't need to pay much attention to it until I understand it all. Strangely, for all the tutorials the game shoves at you, I didn't see one that mentioned the skill upgrades. It's a giant disk that has lots of nodes on it, each representing the spells and skills in the game, plus the passives and super moves of the individual girls. Since each girl can equip any weapon, they can also learn all the skills for that weapon. Each skill requires points, which are mostly gained from leveling up your proficiency with each weapon. That would be fine but I don't think the game mentioned that important part. The skill disc will also function better when you realize you can zoom in. It starts out very small and it was hurting my eyes trying to see it all before I realized there was a zoom feature. Oops. Since they are all laid out in different configurations, it can be a chore to find any given skill in a timely fashion. I wanted to work towards the super moves as soon as I could, and it was a pain to find each one. Same thing with their passive abilities. Thankfully if you find a skill node with a prerequisite, the required node is highlighted. That made it slightly easier to find ones I needed, but sadly it's still too cluttered. The skills themselves are fine, just navigating each character's disk is more time consuming than it really should be. There are a few more features to the game. Besides the main quests, there are plenty of side quests to complete. They aren't all obtained from the computer in the base, which again, was strangely not mentioned in one of the many tutorials. I feel like I missed at least one, but I won't know for sure until I go through the game a subsequent time. Anyway, the ones obtained in town have a stricter time limit, and I even timed an early one out. I'd be less salty about it, but the item I needed for it was obtained as a drop from the boss that advanced the plot and timed the side quest out. Grumbling ensued. To round out the features, there's also weapon and equipment crafting. Weapons weren't necessary to craft early on, as you find them as well, but a lot of the other stuff has to be made. To get some of the materials necessary, you have to break down enemy drops and other pieces of equipment, so it can be very costly to use the system. Outfit pieces you make will show up on the character models. You can also buy new hair styles and colors with special coins you earn in the game, so you can tailor the look of each girl. Granted, you can also change their underwear, but it didn't come across as creepy as it sounds. One last thing I should probably mention are the little concert performances you can do. There are thankfully preset ones, because you can edit a lot of the specific things that go on, such as camera angles, positioning, dance moves, effects and even which girls sing what line. It's pretty daunting, and this is coming from someone that loves doing similar things in the WWE games for my entrance. It's not quite my thing here, but if you are interested in it, there is plenty of stuff with the concerts. While it is still a niche game that won't appeal to everyone, I like Omega Quintet. The battles were fun and I enjoyed the characters interacting with each other. The game might be a little formulaic with its progression, but I liked that each chapter was framed like an episode of a TV show. There's also not as much fan service as you might suspect, although it was present for a few scenes. I liked the game and I'm looking forward to going back to play it some more. The original Toukiden caught me by surprise. It was very fun, and I ended up playing it for many hours after I had finished my review. It has strong influences from the Monster Hunter series, but does a lot of new things that make it stand well enough on its own. I was excited that the expanded game, Kiwami, was headed to the US and EU so I could play it some more. I got even more excited when I saw it was not only continuing to be on the Vita, but coming to the PS4 as well! While the portability is very handy for the multiplayer monster hunting genre, playing it on a console is something I prefer, so I opted for the PS4 version. It is certainly the prettier of the two choices, but I wouldn't say it's the best looking PS4 game. Good enough, though! If you are new to the series, I'll fill you in on the basic gist and combat (if you are versed, feel free to skip ahead to the next paragraph). You play as a slayer and are tasked with defending your village from giant Oni that try to break though your barrier and, well, kill everyone. So most missions are focused on you and a group of up to three other slayers taking down big bosses. Square, triangle and circle all do different attacks while X is your dodge. You can also equip up to three mitama to one of your weapons that give you different skills and passive abilities. In the fights with these giant monsters, you can sever or destroy various parts of them, which will give you more rewards at quest completion. Parts are used to make new weapons and armor, so expect to fight monsters a few times to upgrade your equipment. It might sound like a lot to take it, but it is basically you and up to three others (AI or online) taking down big bosses and making armor and weapons out of them. Toukiden: Kiwami adds three new weapon types - a rifle, naginata and a giant club - to the six already present. I'll start with the club. I didn't like it. It wasn't bad, but wasn't for me. It reminds me of the great sword from Monster Hunter: big, slow and you do more damage when you hit enemies with the end of it. However, it does have a nice reward in Toukiden for doing so. Hit with the tip a few times, and you get a damage boost. The next new weapon is the naginata. It is fast, like the dual knives, but hits a wider area. If you get enough unscathed hits, you will increase the damage area. If that wasn't enough, it also has a move that puts you in the air for air combos. As a dual knife user, I am totally going to work some naginata use into my character. I really like it. I didn't think I would, since there is already a spear in the game, but I was wrong. It also has a parry move, but I doubt I'll use it. The last weapon addition is the rifle. Each has three kinds of ammo that you choose what order to load into it. It aims really well, and even shows weak points on the monsters that cause extra damage if shot. The rifle is a fun weapon, and will probably compete with naginata for my secondary weapon. It can be a bit cumbersome at first, and reload can feel a bit slow, but they had to even the weapon out somehow. Honestly, I don't think I'd use the rifle if I were on the Vita version, but it feels really good on the Dualshock 4. Besides the new weapons, there are of course new missions, more story chapters and new monsters. With the new monsters comes new weapons and armor to create from each one. The new story chapters fits well enough into the original story, as they are set after the closing events of that title. Probably my favorite new addition is sending the other hunters on a sub-mission. Whenever you head out, you can choose one unused slayer to do another mission in any previous chapter. For example, if you are doing a mission in chapter 5, you can send another into chapter 4 or below. This is a good way to get more monster parts without grinding so much, since you can continue on in the story but still get parts from a certain monster. I used it to finally get the Cthonian cloaks that I needed for a quest, but couldn't get to drop in the 20 or so times I did the mission in the vanilla game. Plus, it doesn't seem to cost anything to send them out, so why not use it? There was also a small but awesome change to the Mitama. They can now be leveled up to 12 instead of 10. That's not the great part, though. They now have a forth skill when they reach maximum level, and you can freely replace the other three skills then, too. Before, you had to replace one with another, but there was no efficient way to reclaim skills you overwrote. The only choice you had was to set the mitama at level 1 again and raise it back up. In Kiwami, there is no need to do so, as you can just max it out and set which three you want that it learned. They even added a new mitama type that excels at destroying parts. Nice! If you played the original version, the save file from the Vita will transfer over as long as you download the update for it. That let me keep all my stuff that I earned over 80+ hours and start on the new content. You can also keep your stuff but start the story over again. Either way, it is expected and awesome that you can port over your save. If you play far enough in the demo, that can transfer over too. Both bring bonuses, which is a great incentive to continue... as if saving all that time wasn't incentive enough. I played a few matches of the multiplayer, and they felt smooth. I wasn't using any form of microphone, but we didn't have any troubles taking down the monster. In fact, it was a lot faster than with the AI companions. If you don't want to or can't connect to the internet to play with others, you can just use the story companions and do them anyway. Even late at night I found several lobbies to join, but I don't know how long that will last. As always, if you have friends to play with you, that is the best choice. Now, I just need to convince my friends to get the game, which shouldn't be hard because the game is really fun. As a fan of the "vanilla" Toukiden, I of course like the expansion. 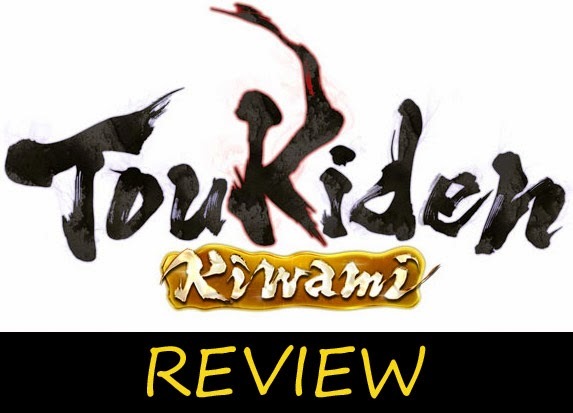 If you liked the original, I would recommend Toukiden: Kiwami if you want more. If you skipped the original release but were interested in it, I'd again recommend it for the sheer amount of content you will get. I'd also recommend it if you want to try to get into the monster hunting genre, since Toukiden is fast paced and more forgiving than other entries, without being easy. If you are on the fence, at least try the demo, since you can carry the save over to the full version. Fans of hunting games, action games and Koei games should definitely check it out! Following in the tradition of previous Dynasty Warriors games, the latest in the series has now received its Empires game. Dynasty Warriors 8 Empires has added new weapons to some of the existing cast (although some of them were DLC previously), and thankfully brings back my favorite staple of the series: creating your own characters. It's no secret that I'm a fan of create-a-characters in multiple games, and I still love it here. There are a lot of costume pieces to choose from, as they brought back pretty much all of the ones from the previous game, and added the DLC ones and a few new ones to inflate the list. With the new additional weapons, there are almost too many choices when setting the weapon and musou attacks. Besides setting a normal and alternate musou, you can set an air one and your rage attack one. While you can't set any musou in any slot unfortunately, it's easy to get some that fit your character, or just take some all around good ones. Although the animation of each contains the character's default weapon, so it can look a bit silly if you just grab some of the cooler ones instead of trying to have them match. If that wasn't enough, you can also customize your troops, horse and war banner. These options are somewhat more limited, but it's still a nice addition to the series and makes for some more personal touches if you want to invest the time. There are several colors for each part and each costume piece. Enough of me gushing about the create-a-warrior, let's get to the gameplay. Like the previous Empires games, it is a mix of hack and slash Dynasty Warriors battles with kingdom management in between the fights. When you are a subordinate for a ruler, you can sometimes choose what to do to help the kingdom, but will be requested to make certain goals. If you become the ruler yourself, you will have more options available, but also more responsibility in making your kingdom thrive. One new objective to complete is quests. These are small scale fights that task you with fighting or protecting someone or something. They are tiny and quick battles that don't feature nearly as many foes as the army versus army fights, but they are a quick way to raise your virtue or get some money or equipment. It's not too complicated to run a kingdom, but it is fun. The virtue is basically your level this time around. In the previous entry, there were six kinds of experience, depending on what your actions were. Now it is just virtue. There are also merits to be earned by performing well for your ruler. While I liked the previous system of six different types, this system is fine too, as it feels less like the character is typecast as a certain type of person. There are several different scenarios to complete, each ranging from a set of dates in Chinese history. This will dictate what special battles will happen, and what characters you will see, but it won't limit your time there. Each scenario is self-contained and will play out differently each time you play it. Some will last a long time, depending on the whims of the leaders. The scenarios won't stand out much from each other if you aren't at least passively versed in the story or history of the three kingdoms period, so if you aren't interested in that, just pick the special scenario that has all the Dynasty Warriors cast available. Plus, you can always sub in any of your created fighters, and might even see some creations of other people! While my primary reason for liking the Dynasty Warriors Empires series is the create-a-character, they are fun alternate experiences in the Dynasty Warriors universe. It adds some management and unpredictability to the hack and slash series, and I know at least one person that prefers Empires to the usual games. Fans of the Dynasty Warriors series and the Empires series should check it out. It's also worth checking out for people that want more than just a hack and slash experience. Project X Zone 2 and Monster Hunter Stories Announced! Wow. As a fan of the first Project X Zone, I was happy to see late last night that Bandai Namco (Bamco, as I call them) announced not only the release of a sequel, but that the sequel was heading outside of Japan as well. Planned for a fall release in the US, I am definitely excited to get it! The first was probably the first game I played on it that made my 3DS purchase worth it. Project X Zone 2 will of course be adding new characters, and even replacing a few, based off the trailer. Gone is Pai, replaced with Kage, both from Virtua Fighter. Leon from Resident Evil 6 is joining, as is some people from the Yakuza series. Thankfully X and Zero return from Megaman X, and now Virgil from Devil May Cry joins his brother Dante (eat that, stupid Dimitri!) And for better or worse, Haseo from .Hack//GU is replacing Blackrose from the original .Hack. While I liked GU and think it should have some representation, it seems weird that they replaced two females with guys. Either way, I'm still looking forward to playing it on the 3DS later this year. Also on the 3DS, Capcom announed Monster Hunter Stories. Slated for release in Japan in 2016, I am hoping the game makes its way west as well. It is an actual RPG this time, with cutesy graphics, but still with the terrifying Tigrex. I have no idea why they would use him in a trailer, since... ah, nevermind. Anyway, it seems you play as people who ride some of the monsters, since the trailer has the protagonist ride a small Rathalos to escape his pursuer that doesn't understand "no means no". I'm sure Mark will love that. The game definitely looks different, I'm still deciding if I like it or not. Still, I'm hoping it makes its way outside of Japan with the forthcoming Monster Hunter 5. The trailer for Monster Hunter Stories is here. 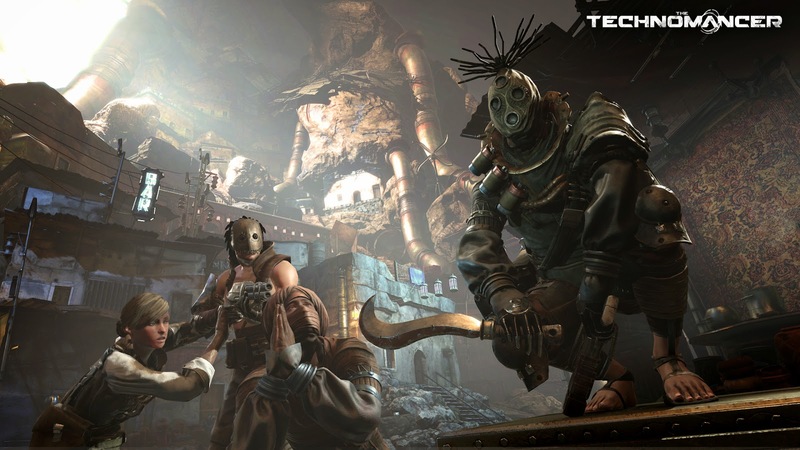 Earlier today, Spiders and Focus Home Interactive announced that they were making a new sci-fi themed RPG called The Technomancer for PS4, Xbox One and PC. It is slated for a 2016 release. The press release touts that there will be four skill trees, three fighting styles, dynamic conversation choices and crafting. Damascus Gear: Operation Tokyo hit the PS Vita's store recently. Why did it catch my attention? Well, it had robots in it, and it was listed as a hack and slash game. Sold! It is pretty much as described. The game is an isometric view with lots of hacking, slashing and shooting. Kind of like Diablo. 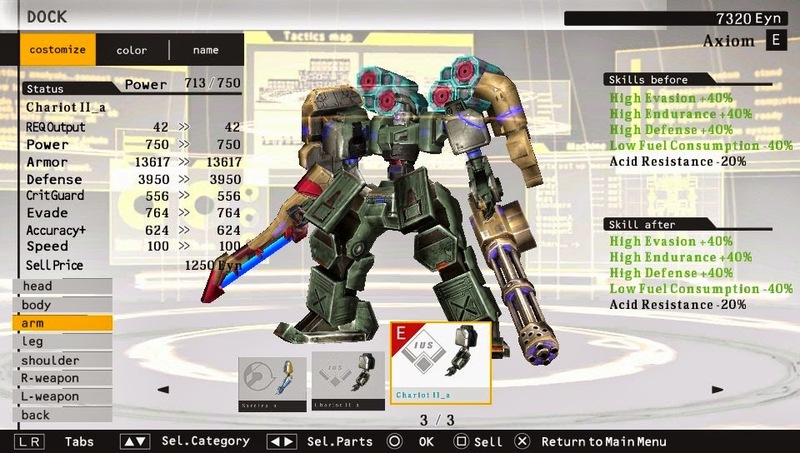 However, your character pilots around a mech that is built from parts and weapons you select. Kind of like Armored Core. So, the game is really a fusion of those two, and it is pulled off pretty well. It also has a story unlike either of those. The world of Damascus Gear is an almost post-apocolyptic world with small enclaves of human survivors that battle sentient battle mechs. The standout for me, character-wise, is the operator Mirai. She's so pessimistic, but somehow makes it seem cheery. I really like her lines. They make me smile. Note that the game uses the Japanese conventions for buttons, so Circle is accept and X is cancel. It's not the hugest problem in the world, but it does take some adjusting, since in the US we frequently use it the opposite way of that. In combat, however, that isn't a problem. Square and Triangle are the weapons in your left and right hand respectively, and the Circle button is your back weapon, if one is equipped. The hand held weapons can be stuff like rifles, laser guns, swords and pile bunkers. The back weapons tend to be the heavy hitters like missile launchers and big laser blasts. I favored a sword for hitting multiple enemies up close, and a rifle for some distance attacks. Once I got a back weapon, the stronger, the better! It was really helpful to deal with the pesky life bar of bosses. In keeping with the Armored Core style of play, the game is divided up into many missions, separated by rank. The higher the rank, the harder and more powerful the enemies. There are a lot more missions then I thought there would be, and some of them are optional. The higher ranked missions are definitely harder, even with better equipment. That said, I learned pretty quickly and after an unsuccessful run, I would then come out ahead. Plus, you seem to keep what you picked up in a mission, even if you fail, so there's no reason not to push onwards. Fights can be a little clunky, since enemies don't have many tells before they attack, just a time frame where they won't. So when an evil robot slashes at you, dodge first, then you can get a free hit or two before it can attack again. It's not foolproof, since you often fight multiple enemies, but trying to get the timing down is essential for the boss-like fights. These enemies can do a lot of damage really quickly. In general, it's easier to get hit than you think at first, so make sure to watch your health bar. Thankfully there are repair kits you can find/buy/use to refill your health. They aren't the cheapest, so frequently I took the chance that I could finish the mission without using one. I was usually correct. Aiming at certain enemies with ranged attacks is also a bit tricky, but you don't have ammo, just a recharge meter instead. I like that. One of the best aspect of games like this is assembling your mech. Granted, some parts have better stats than others, but you do get a fair amount of freedom in what parts and weapons you want. Also, it can be tough to just load on all the best stuff, since you need to pay attention to the power limit of the torso you pick. But enough about that. You can paint the various pieces! The colors of each part and weapon can be changed individually, and you get a good selection of colors to do it with. When I first started messing around with the paints, I was looking for a good blue on the legs. Then inspiration struck and I made the top and arms red. I nicknamed it Prime, and the boxy robot sort of resembled the Autobot leader. I will admit that made me smile more than it should have, but it was cool. I even made the sword orange to mimic the blade from the Bay movies. Damascus Gear: Operation Tokyo is a fun game with many missions to complete. However there doesn't seem to be much more to it than that, so replay is toward the lower end of the scale. Since it's a budget download, you easily get your money's worth if you go through the story and do all the missions. I like the game and I think it would be even better if there was some ability to play it in co-op (even though none of my friend have the game), or if the game had more adventure elements and was less mission-like. 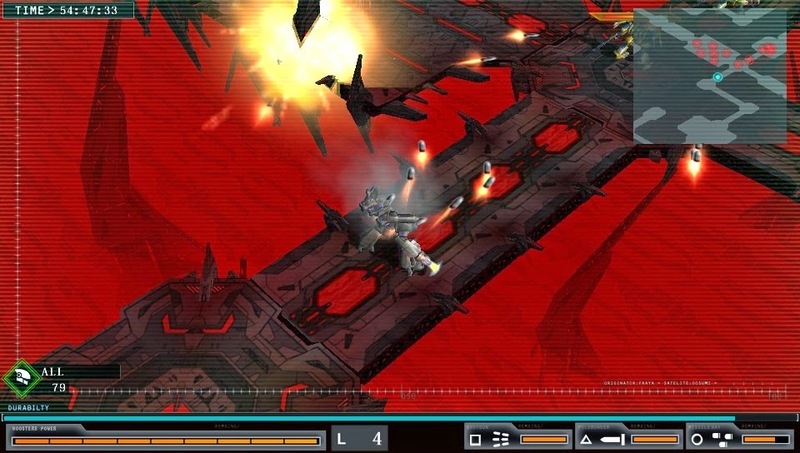 Still, a fun game for hack & slash and mech fans! I love bullet hell games, so I have no idea how I missed the existence of the original Jamestown. Once I saw the plus version was coming to PS4, I knew I had to give it a try. 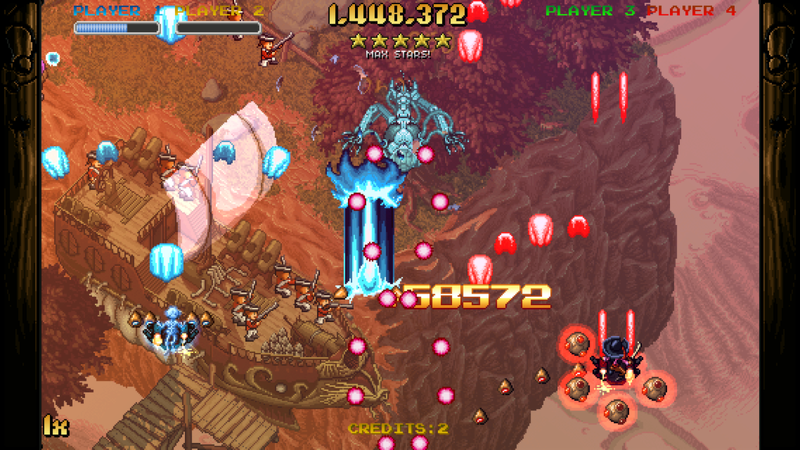 Jamestown+ is a very retro feeling shmup, mostly thanks to the graphics. I'm always happy to see good old sprites. The music is also reminiscent of older arcade shooters, but is wholly its own. The story is pretty original too - you are on a mission to clear your name by battling the Spanish... on Mars. Yes, in this game's alternate reality, we traveled to Mars in the 1800s and are battling the combined forces of the Spanish and the Martians. It's pretty silly, but I like how far out there it is. Before you start a stage, you choose one weapon to use. There is a good variety once you have purchased them from the store. Granted, I heavily favored the default one, since it was a great mix for my playstyle. The X Button fires your normal shot (I later changed this to R1 since my thumb was starting to cramp), and Square is your special shot. Both are unique to whichever weapon set you choose. As mentioned before, I favored the one you start with. The normal shot is a spread, and the special shot is a focused laser for damage. It's basically what I would want, but I made sure to try a lot of the other ones after I had unlocked and purchased them. There is a good variety of weapon sets to try, as long as you can meet the requirements to unlock them, which sadly includes beating all the stages on the higher difficulties. The other ability at your disposal is the Vaunt system. You have to first fill a meter by collecting the little gears that appear when you kill enemies. Once it's full, you can activate a bullet absorbing shield for a brief time, and then you have 1.5x attack power and double score until the meter runs out. The non-mandatory tutorial explains it pretty well, so make sure you check it out in the game. I didn't at first, so I wasn't really using it properly. I treated it as a shield at first, but it is much more effective to increase score and as an attack buff. Once I treated it as such, I was routinely getting five star scores and killing enemies faster. It can very much still work as a very short shield, so figuring out when to use it will make the game easier. Sadly, there is not bomb item, and the Vaunt system is as close as you can get, so you might as well make it work for you. After all that, though, I have one major problem with the game: the progression. There are five story stages, but you can only complete the first three on the normal difficulty selection. To unlock the fourth, the first three must be beat on hard, and then those four must be beat on the next higher to unlock stage five. It's honestly not that hard since your continues are per level so you should be able to power through it, but I don't like locking the rest of the game behind a difficulty selection. The same system applies to the extra Moon levels, except even higher. The last moon stage is actually very hard, with no way to do it on anything but the forth or fifth highest difficulty. There is also a Gauntlet mode, that acts more like an arcade setting, where you have to complete all of the stages with limited continues (they are not per stage, but per play). Again, you can only do so many stages based off the difficulty selected, making it harder and longer. Wow, don't read that out of context. Anyway, there are also challenges to complete, because... why not? I'm not a fan of them, but they are easy enough to add for some more content. I tried a few of the first ones, and, yes, they are pretty difficult! Nothing makes me feel worse at shmups than challenge levels, even if I can nearly 1cc (credit clear) a game. Jamestown+ does have local co-op, and it works well. It's only slightly different from normal, since you no longer have lives. Instead, if someone dies, they will respawn after some time if at least one person is left alive. Otherwise, there is a power-up that spawns that can revive everyone. The timing of the power-up is questionable, since it seemed to spawn for my wife and I near the beginning of stages, and when neither of us was dead. If all players are dead at once, then you can use on of your continues to bring everyone back, subject to the limitations of the continue by game mode. There's also a DLC pack that contains four new weapon sets. The ghost weapon is my favorite of the DLC ones. It's fun to use, but it's not going to replace my favorite. The other three are ok, but I would only really use them once to try them out or get one of the added trophies. I really like Jamestown+. It is a very fun shmup/shooter/space shooter with an interesting Vaunt system. There is also a good amount of different weapons to try. I'm not a fan of locking the further stages behind higher difficulties, even if it wasn't too hard to get them all. However, unlocking all the ships and challenges are difficult, but it gives you so more things to do after beating the main story. It also has some fun co-op, if you have other shmup fans in your house. Awakened Fate Ultimatum is the successor to 2013's Guided Fate Paradox. While this title is easier to say, and both titles make sense once you play the game... the names are still strange and can be hard to remember which was first. While the first game had some really cool systems, the rogue-like elements wore on me. Let's see how the (non-direct) sequel is. Awakened Fate Ultimatum doesn't continue the story of the previous game, but it has a similar premise: you play as a special guy who is given godly power over fate, and able to shape people's destinies. This time, you have choices to make and further drive the idea of you having the power over the destiny of others. Well, at least they try to. Each choice basically has an angel and a demon answers (not necessarily "good" or "evil"), and they correspond to the two companions you have in the game. Each choice will also reward you with a skill point in that particular skill tree, which I'll discuss more in a bit. The story does its best to blur the lines between who or what is evil and good, and for the most part it does it pretty well. The characters do have some depth to them, and the main character frequently wrestles with the consequences of his (your) choices. Some of the choices are difficult if you are invested in the story. However, sometimes the choices don't seem to matter, as what happens seems the same no matter which choice you make. That part is a little disappointing, but at least you get a free skill point out of it. Even so, I enjoyed the story and the main characters. The plot moves you along from dungeon to dungeon, and every floor of them is randomly generated. Whenever you take an action, like attacking or moving, the enemies do as well. There is no time limit between turns, so you are free to plan to your heart's content. Your goal on each floor is to find the portal to the next floor. After a few floors, there is usually a cut scene. Thankfully they are spaced much better and shorter than the previous game. I got sick of them in Guided, but not in Awakened. The dungeons themselves do look different from each other, but they aren't the most interesting, and aren't even as varied as the previous game's. The enemies are more varied, since there are two versions -and angel and devil- of most of them. If you played the previous game, you might remember that every time you entered a dungeon, your level was reset to 1. When you left, your level was added to your "total level", which affected your base stats. For better or worse, that system is now gone. Any levels you get are yours to keep when you leave the dungeon. That means dungeons now have a level for them, and are a little easier to complete. This feels a little more balanced, and it is much clearer to understand how to increase your stats, so I consider it an improvement. It's not as unique this time around, but I prefer this system. Equipment is also more streamlined...or cut down, depending on how you look at it. Before, you could equip several pieces of equipment on different areas, and they would show on your character. Now, you only get a weapon, shield and an accessory. I preferred more equipment, but at least your character looks less silly than in Guided. The trade-off for having less equipment pieces is that they no longer break. While it was integral to the power-up system, I do not like equipment durability. Nothing makes me want to use powerful stuff less than knowing it will eventually be useless. You can still fuse like equipment to make it more powerful. However, if you die in the dungeon, what you have with you, including your equipment, is gone. Such is the nature of rogue-likes. The new system that defines Awakened Fate Ultimatum is called "deitize". It allows you to assume either devil or angel powers in battle. It activates with a simple button press, and thankfully doesn't take a turn to do so. It adds a little bit of strategy to fights, since you use angel to do more damage to devil, and vice-versa. It takes SP to maintain the form and use skills, so you have to think carefully about how long you want, and if the cost of a skill is worth it. Admittedly, it feels like it makes this type of game easier, but your overall low HP seems to even it out. Plus, you no longer have a companion, as you did in the previous game, so you need something to help you in fights. To me, the star of the previous game, Guided Fate Paradox, was the system to power-up your character. Unfortunately, that great, unique and customizable system is gone. What replaces it are two different skill trees, each one affecting the angel or demon deitize. There are health, attack, and defense upgrades, as well as active skills you can use, such as an HP drain (a personal favorite), or a dash attack, to name a few. These skills and upgrades only affect the corresponding form, so you won't notice much difference until you sink many points into them. Also, they are fairly linear, with the only real choices being starting to the left or right, and which "feathers" you go down on the wings. You can easily get all the skills quickly by going one direction, but it is much harder to skip active skills you may not want or use. Not a bad system, but not near as enjoyable as the previous game's. There are 14 chapters to the main story, although each doesn't take more than a few hours. There are a few endings, a new game+ and post game content to give it some good replay value. Plus, you can change the choices you made and see if it affects much. Most of the trophies are standard too, but unfortunately, a lot of them are hidden. Nothing seems to be missable, though, so I'm happy for that. I like Awakened Fate Ultimatum, but I'm not sure if I like it more or the same than its spiritual predecessor, Guided Fate Paradox. It has some good improvements, like the story, the choice system and deitize, but also some not as good changes, like the loss of the power-up system. I do like the story Awakened tells, and the deitizing added some more strategy to battles and leveling up. All in all, a worthy successor, so fans of the first or mystery dungeon RPGs in general, should try it out. Paperbound has been recently released on the PS4 and Steam, and I had a chance to check it out. At first I played a bit of single player against some bots, but I made sure to try a little bit of the multiplayer as well. Paperbound is a versus brawler, and as such, has 2-4 combatants in a small arena. You have a basic sword attack, one pair of scissors that you can throw (and pick up if you miss), and an ink bomb. Getting hit with any of these will kill you, so best to keep moving and attacking. The scissors represent a ranged attack, but with only one shot, you had better make it count. If you stand still to try and line up the shot, you will likely be killed. With skilled timing, hitting the scissors with your sword will reflect it back. Also, you can pick up a pair of scissors that somebody missed with to replenish yours. The ink bomb is a little more forgiving, since it has an area of effect. However, it is just as easy to catch yourself in the explosion if you aren't careful. Sadly, I've caught myself with it a few times. It will also obey gravity, which makes it behave in unexpected ways if you aren't paying attention. With up to four people running around, swinging and throwing, it can get very chaotic. That's the appeal of the game- running around, trying to kill while not being killed yourself. Games can be over in an instant, since death can come quickly. You can die especially quick if you spawn near the AI. Since they are instantly aware of you, and it takes you a second or two to figure out where you are and orient yourself, they can take advantage of it for an easy point. To add an interesting twist, the game also features a gravity mechanic. Pressing a button will allow you to invert your gravity. It definitely makes for a more interesting match, but boy is it confusing. This does make most levels circular in nature, so you can run up walls and on the ceiling with minimal effort. It can be very tough to figure out how to land on certain ledges, which is only really problematic in the stages with traps and hazards. Otherwise, it makes playing much more chaotic, and sometimes more fun. Just be aware that others, especially the computer, might adjust quicker to the sudden shifts and hold the advantage... so use it with caution! Thankfully, the game has bots, so if you don't have four people to play it with, you can fill out the ranks with the AI. Sadly, the game is local (or couch) multiplayer only. It's a curious choice, since there's very little reason to play it by yourself. If you want to play it with your friends, which is really the only way, then they all have to be in the same room. While I'm a huge proponent of local co-op, Paperbound really feels like it needed online as well. I won't pretend to know the logistics of if it was possible to add it, but it is a curious omission regardless. There is a good selection of stages to fight in, some with traps and others without. Strangely, the last few have to be unlocked. You only have to play a few matches to get them, so it just seems strange to lock them at all. There's also several characters to choose from. They look unique, but don't really have any other differences. So just pick the one you like, choose a color you like and fight away. There are free for all and team matches in the standard deathmatch and king of the hill. They even added a unique win mechanic, where even if you have enough points to win, you have to get to the tear in the page to actually be the victor. It's an interesting twist that can sway a close game... or make it easier to punish the winner. It's not over until it's actually over! I can see the appeal of Paperbound. If you have a group of friends over to the play a game, it would be a great way to spend an evening. There's not really enough modes or differences in the stages and characters to warrant continued play, though. If you don't have a few people to play with at your house, or aren't into versus combat, then Paperbound isn't right for you. But, if you have some buddies over and are looking for a wild and chaotic game, then Paperbound just might be a game for you to try.